There are several different things you can use as cleaning solution for blackboard slates common at many schools. All will clean the chalk off of the boards and give them a smooth appearance. Choose your solution based on the items you have on hand and the time you have available to clean your board. Lay a 6" by 6" cloth on the table. Place two teaspoons of lemon oil in its center. Fold the cloth into a 2" by 2" square and place it in a resealable plastic bag. Seal the bag and let the cloth sit for 24 hours. Wipe the board with the cloth. Do not rinse if first. Since you have to let the cloth sit for "treatment" before you use it, it's a good idea to rotate two of them so you have one to use every day. Replace your cloths when they get too soiled. 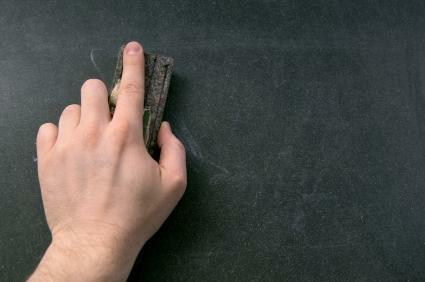 A lot of times teachers use just water to clean their blackboards. Adding vinegar to it can help prevent streaks and give the classroom a fresh smell. It's best to use white vinegar, since it doesn't have any natural dyes in it that can affect the board's color. Put four cups of lukewarm water in a bucket. Add half a cup of vinegar and stir. Dip a cloth in the solution and wring it out. Wipe the board in rows and then let it air dry. Zig Chalkboard Cleaner: This cleaner is water-based and comes with a ready to use applicator on top of the bottle. All you have to do is wipe the board with a towel. Amrep Misty Chalkboard Cleaner: This water-based foam not only cleans the board but polishes it too to give the board an expert matte finish. It has a mint scent to boot. Again, all you need to do is wipe it off. The foam helps it cling to the board instead of dripping down. A lot people think they don't need cleaning solutions for their boards, that they can simply use water and a sponge as part of their daily cleaning tasks. The main problem with that is something called "ghosting." This occurs when the water washes away most of the chalk but you can still see an outline if you walk close to the board. After using the board for the entire school year, the ghosting can become so bad the board is barely readable. It's especially bad if you use colored chalk. A secondary problem is streaks, which again don't show up too badly unless you are very close to the board.Since a commercial cleaning solution for blackboard is specifically designed to deal with these issues, and there are also remedies you can make yourself, there's no reason to have a streaky or dirty black board. Now students will have to find another excuse as to why they didn't get the homework assignment.